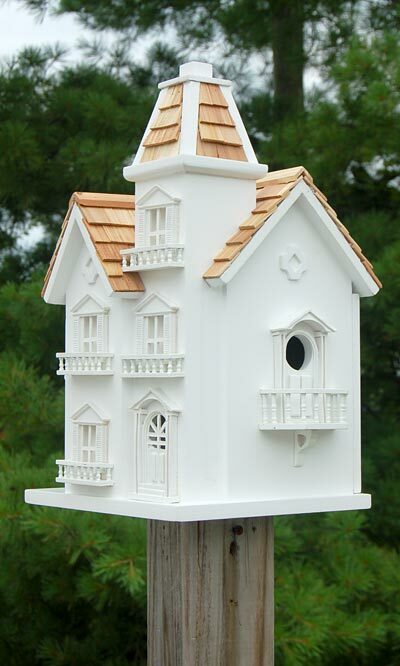 Properly invite birds into your birding sanctuary using the Home Bazaar Victorian Manor Bird House. Victorian architecture abounds in this structure, featuring a dormered roof and turret on one side. No detail is overlooked, such as the paned windows, porch railings, and even two small bird houses on the side of the home. The crisp white paint sharply contrasts the pine shingled roof, combining to create a truly artistic bird house. The 1.125" diameter openings are also protected by shingled overhangs, and the structure provides room for an entire bird family. The back panel easily removes for seasonal cleanouts, and a small gap between the roof and the panel offers plenty of ventilation. Use the included wall bracket or post mount this home in your yard and allow your birds to roost in your garden year after year. Note: Should you want to preserve the finish (paint) of this house, you should select a polyurethane product that is recommended for marine use (UV Rated) that will not turn the white paint yellow. You should expect that once left outside, the home will weather and require refinishing.